Sometimes the deepest friendships take a while to solidify. They don’t seem obvious at first. Maybe you have different interests, different backgrounds. Maybe one of you is a human being and the other is a dishwasher. Whatever the barriers are, they can often fall away once you spend a lot of time with someone. My dishwasher and I are constantly interacting, and over the past several years I’d say we’ve reached a certain level of intimacy. Fun fact – She’s not original to the house. When I bought my house it came with a dishwasher that spoke 17 languages. I’m sure you know someone like this. She was kind of braggy about it, shifting from one language to the next with no prompting by me. Thankfully, one of these was English, but she never stuck with it for long. Some days when she was speaking some Slavic language I’d pretend like it was fun. I’d act playful like I do at Ikea where everything is an inexpensive and unnecessarily complicated puzzle. But on the days when she was Japanese I sort of felt like the whole thing was rigged against me and I was letting her down. Sometimes friendships just get to be too much work. And to be honest she needed way too much affirmation, letting out a big clang every time she finished a cycle. I’d roll my eyes, Geez, do you want me to throw you a parade? If I didn’t know the 50-minute cycle was over because 50 minutes had passed, I was reminded by the clang and then by a display panel boasting Finished! Or Finito! Or Päättynyt, which is actually the Finnish word for finished. It was just too much. I feel bad saying this, but I was glad when she died. Her replacement is the best, and it wasn’t long until we became close friends. She’s German but she speaks English, which helps us find common ground. After the coffee maker, she’s the first appliance I reach for in the morning. We like to play a game where I press go on the coffee maker and see if I can unload all the dishes before the coffee’s ready. Some days I nail it, some days I fall short. Those failed days are usually the ones when there’s Tupperware on the top shelf and I have to hand wipe those infuriating drops of water off the plastic. This is when we argue. Why, I need to know, can she dry everything but the Tupperware? It’s like she purposefully directs her heat to avoid it. She’s defiant about this, providing no real answers but reminds me that I’m slowly poisoning my family by putting that stuff in the dishwasher anyway. Touché, Fraulein. Touché. After all, I respect her and her work ethic. 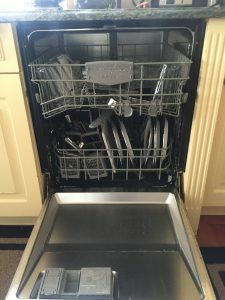 And not to judge, but I find it kind of offensive the way some people coddle their dishwashers by wiping their dishes completely clean before loading. It’s kind of like taking a strep test before you go see the doctor. You might as well just come out and call him incompetent. Not me. I scrape the big chunks into the trash and let her do what she does best. This backfires of course with things like mozzarella cheese and chia seeds. She has a sensitive digestive system and these things seem to, well, clog her up. Sorry if that was too personal. That bit of information probably wasn’t mine to share. We touch base every day, but our quality time really happens on the weekends. Everyone’s home, everyone’s hungry and everyone likes to approach each drink with a new glass. The weekends are when her little spinning arm gets an ironman’s workout, and by Monday morning she needs a rest. You’d think my family would resent this relationship, as much time as we spend together. But no, the truth is that they really give us our space. My kids in particular like to give her privacy. They approach her with a dirty mug in hand, slowly open her door just a crack to check things out. If, God forbid, her contents are clean, they slam that door, leave the mug on the counter and flee the scene. It’s cute how they don’t want to take away from our special time.